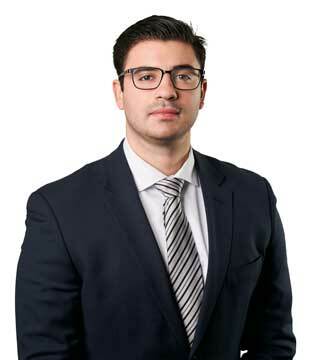 LAWRENCE J. AMATO is an associate attorney at GWC, where he works in the firm’s Litigation division. After graduating from St. Norbert College with a bachelor’s degree in Business Administration, Lawrence attended The John Marshall Law School where he earned his Juris Doctorate. Throughout his time in law school, Lawrence worked as a teaching assistant for first-year law students in Torts and Legal Writing classes. He later completed a judicial externship for the Honorable Judge John Callahan of the Circuit Court of Cook County. Lawrence also competed on several mock trial teams throughout his time at John Marshall. As a first-year law student, his team placed 1st in John Marshall’s annual school wide mock trial competition. He later participated in nationwide tournaments as a member of John Marshall’s trial team, including an international competition in Puerto Rico where his team placed in the top four overall. In his spare time, Lawrence enjoys spending time with his family and friends.